Screenshot of the turbulent conditions inside a core-collapse supernova simulation carried out by the Blue Waters supercomputer. Although intense magnetic fields have long been assumed as the driving force behind the most powerful supernovas, astrophysicists have now created a computer model that simulates a dying stars' magnetic guts before generating a cosmic monster. Over a period of one second, the star's core will dramatically implode, from around 1,000 miles to 10 miles across, initiating the mother of all shock waves that, ultimately, rip the star to shreds. This is the short story: star runs out of fuel, implodes, shockwaves, massive explosion. All that’s left is a rapidly expanding cloud of super-heated gas and a tiny neutron star rapidly spinning where the star’s core used to live. Besides sounding like the next Marvel Comics movie baddie, a hypernova is the epitome of magnetic intensity. As a massive star’s core begins to collapse, it doesn’t only experience a rapid increase in density; the spin of the star is conserved, and, like an ice-skater who retracts her arms while spinning on the spot, the core of the collapsing star will rapidly "spin up" as it shrinks. Along with all this spinning violence, turbulent flows in the superheated plasma spike and the magnetic field of the star becomes extremely concentrated. Artist's impression of a hypernova, generating 2 gamma-ray jets. Until now, these effects of core collapse supernovas were pretty well understood — though firmly based in theory, observations of supernovae appear to provide observational evidence of this theory. But the mechanisms behind hypernovae (and gamma-ray bursts) haven't been fully appreciated, until now. "We were looking for the basic mechanism, the core engine, behind how a collapsing star could lead to the formation of jets," said computational scientist Erik Schnetter, of the Perimeter Institute for Theoretical Physics in Waterloo, Ontario, who designed the model to simulate the cores of dying stars. A way to imagine why these jets are so powerful would be to take a stick of dynamite and place it on the ground with a cannonball balanced on top. When the dynamite explodes, it makes a loud bang and might leave a small smoking crater in the ground, but the cannonball probably won’t move very far — it will likely jump a foot in the air and roll into the small crater. But place that same stuck of dynamite in a metal tube, block one end and roll the cannonball into the open end, as the dynamite explodes, all the energy is focused out of the open end, ejecting the ball hundreds of meters into the air. Like our dynamite analogy, most of the hypernova’s energy is concentrated through the two jets -- contained inside magnetic "tubes". So when we see the jet pointing at us, it appears many times brighter (and more powerful) than the sum of its parts if the supernova ejected all of its energy omnidirectionally. This is a gamma-ray burst. "A dynamo is a way of taking the small-scale magnetic structures inside a massive star and converting them into larger and larger magnetic structures needed to produce hypernovae and long gamma-ray bursts," said postdoctoral fellow Philipp Mösta, of the University of California, Berkeley, and first author of a study published in the journal Nature. "That kicks off the process. "People had believed this process could work out. Now we actually show it." According to Mösta, this situation is akin to how powerful hurricanes form in the Earth's atmosphere; small scale turbulent weather phenomena coalesce to form large-scale cyclones. Hypernova could therefore be imagined as the "perfect storm," where small-scale turbulence in a collapsing core drives powerful magnetic fields that, if the conditions are right, produce intense jets of exploding matter. 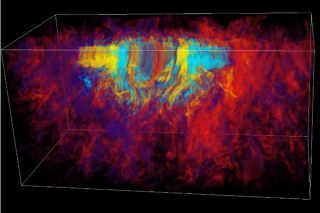 "What we have done are the first global extremely high-resolution simulations of this that actually show that you create this large global field from a purely turbulent one," Mösta said. "The simulations also demonstrate a mechanism to form magnetars, neutron stars with an extremely strong magnetic field, which may be driving a particular class of very bright supernovae."